jobs, workplaces and fitting equipment that will properly interact with the worker and their job demands in order to reduce or eliminate the risk of accidents, injury, chronic pain and repetitive stress thereby protecting the human body. 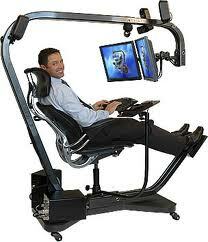 The goal of ergonomics is to minimize fatigue, discomfort, injury and emotional stress. Effective and successful " fits" assure high productivity and injury risks, and increased satisfaction among the workforce. Examples of ergonomic risk factors are found in jobs requiring repetitive, forceful, or repetitive exertions, heavy lifting, pushing, pulling or carry heavy objects, and prolonged awkward postures. Evidence shows that effective ergonomic interventions can lower the physical demands of work tasks. Their potential for reducing injury related cost alone make ergonomic interventions as useful tool for improving companies productivity, product quality, and overall business competitiveness. Over time, the human body has adapted very well to the task of hunting for and gathering food. It performs and feels its best when it is in motion during the day, and resting at night. Sitting all day, on the other hand, puts an enormous strain on the spine and its supporting tendons, ligaments, muscles, and fascia. If you are sitting at a desk and/or computer for more than 1 hour on a regular basis, then you are what we call an "industrial athlete". For you, proper ergonomics and micro-breaks are essential to prevent neck pain, back pain, and headaches, as well as to allow your body to get the best results from your chiropractic care. In the last 30 years the work environment has changed. Over half of all workers in the United States use computers. Computer use presents an interesting situation because there is no single accident that causes injury. Instead, injury accumulates over time through repetitive motions and static postures. If being on the computer at work can hurt you, how about the computer at home? Many people come home from work or school and hop onto the computer for entertainment or social interaction. Doesn't home computer deserve the same consideration as one at a work site? Then what about video games? Isn't a video game just a computer that you place next to your TV? Isn't the TV just a big computer screen? Don't people sit for hours in the same place pressing buttons over and over? Electronics have blurred the lines between work and play, and unfortunately your body doesn't know the difference. People think of Carpal Tunnel Syndrome as being a work injury but what about Blackberry or Gamer's Thumb? The source of repetitive injury can be your work computer, but it can also be your phone in your pocket. 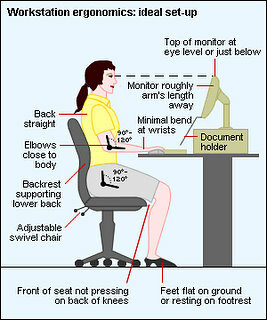 Dr. Pisarek may have excellent suggestions for your ergonomic concerns. Click here to contact him.